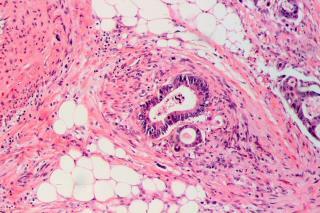 (Newser) – Of cancers that strike both men and women, colorectal cancer is the No. 2 killer in the US, reports the CDC, claiming more than 50,000 lives in 2013. Previous studies out of Harvard found that a common oral bacteria accelerates the cancer's growth in animals, but since the so-called fusobacteria are more prevalent in the mouth than the gut, it remained unclear how fusobacteria localize to the cancer. In a new study published in Cell Host & Microbe, researchers out of Israel and Harvard get at that mystery, finding bacteria may travel from the mouth to the gut and colon via the bloodstream. They tested this by injecting fusobacteria into the tail veins of mice with either precancerous or malignant colorectal tumors; the researchers subsequently detected fusobacteria in the tumors, per a press release. My dentist scares me every visit with all the data linking mouth health with general body health. A little coconut oil every other day or so rubbed onto the gums does wonders. WHAT? I'm going to buy a case of LISTERINE now! & then BUY STOCK of Johnson & Johnson(JNJ) ASAP! After this study! There ya go ALL! !